Joe McKenna focuses his practice upon the litigation of Worker’s Compensation claims and Social Security Disability claims. The son of a union plumber, Joe predominantly represents workers from the building trades and utility industries who have suffered serious injuries. Such injuries range from electrocution, traumatic brain injuries and heart attacks to muscular/skeletal injuries. Joe has lectured widely before both union and non-union groups on the worker’s compensation statute. He is the author of a “Handbook for Injured Workers in Massachusetts” and a perennial recipient of Martindale – Hubbell’s highest rating for legal ability and ethical standards. 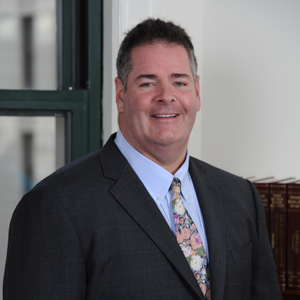 Prior to joining Segal Roitman in 1996, Joe worked in the worker’s compensation department of Wynn and Wynn, P.C. for approximately eight years. Joe also served a clerkship for the late William Joseph Patrick Cleary, administrative judge at the Department of Industrial Accidents.